From today, Friday 30 November 2018, feral horses are officially recognised in NSW as a key threat to native wildlife. The case to address the growing feral horse threat to Kosciuszko National Park is now overwhelming. 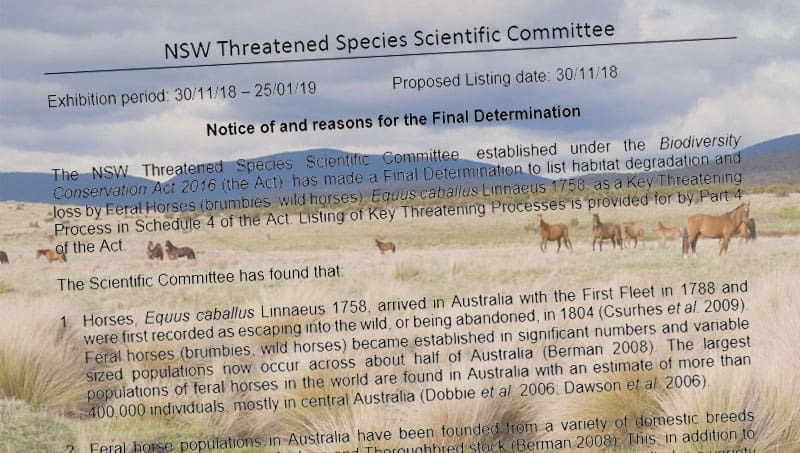 The NSW Scientific Committee listed ‘Degradation and loss by Feral Horses (brumbies, wild horses), Equus caballus’ as a key threatening process under the NSW Biodiversity Conservation Act, effective from 30 November 2018. Leading conservation groups support the listing, including Reclaim Kosci, the Invasive Species Council, the National Parks Association of the ACT, the National Parks Association of NSW, the Colong Foundation for Wilderness, Nature Conservation Council of NSW and Save Kosci. “The state’s scientists have confirmed that feral horses are causing serious harm to native wildlife,” Invasive Species Council CEO Andrew Cox said today. In May, Nationals Party leader and NSW deputy premier John Barilaro successfully passed legislation that protects feral horses in Kosciuszko National Park at the expense of the natural environment. Since then NSW environment minister Gabrielle Upton has had little to say about the issue and has left the deputy premier to lead the process. “We urge the premier to reign in her out-of-control deputy premier and put the environment minister back in charge,” said Richard Swain, Reclaim Kosci coordinator. “Environment groups are calling for the protection given to feral horses in Kosciuszko National Park to be overturned and horse numbers urgently reduced. Twenty three threatened plant species and 11 threatened animal species are impacted by feral horses in NSW, ten of which are critically endangered. This includes the northern and southern corroboree frog, mountain pygmy possum, broad-toothed mouse and the stocky galaxis.”This reiterates the peer reviewed findings of the Kosciuszko Science Conference convened earlier in the month by the Australian Academy of Sciences,” Mr Swain said. “The Save Kosci walkers on a 560km protest trek from Sydney to Mt Kosciuszko were uplifted by the news,” said Linda Groom, Save Kosci convenor.